This experiment turned out WAY better than I thought it would. 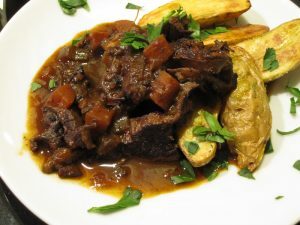 The complex flavors from the cocoa powder and ancho chili powder are a perfect balance with the rich short ribs. The nutty butternut squash is a winner to balance the heat.It makes a ton so call some friends! Heat oil in a large Dutch oven over medium-high heat. Season beef with salt & pepper and add to pan. Cook about 8-10 minutes, browning on all sides. Remove from pan and set aside. Add onion and leeks and cook another 8-10 minutes, until onions are soft and translucent. Add the garlic, chili powder, cocoa, and cumin and cook another 2 minutes, stirring constantly. Add the rotel, tomatoes, beef broth & water. Bring to a boil, reduce heat to low, and cover. Simmer for 1 hour. Add butternut squash and simmer for another hour, until beef and squash are tender. Remove the ribs from the pot & shred the meat. Discard the bones. Add the shredded meat back to the pot with the black beans and cook for 15 more minutes. Serve with cornbread & garnish with cilantro!